Suzhou Eslite Textiles Corp., Ltd.
Hangzhou Mengjia Textile Co., Ltd. 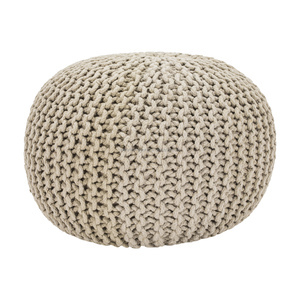 Premium Knitted Cotton Pouf is made of 100% cotton and is filled with certified EPF. The Poufs have 2 Kgs of premium fillings. The Poufs acts as a perfect accent to a Home and easy to place as an additional seating in any room. We strongly believe that quality & price can be met to requirement only if one has a complete in house production. We have an experience of 40 years and we have created numerous, rare exotic, genuine Indian products. We work as a team with full dedication and proficiency to attain our periodic goals and to make our clients satisfy. Guangzhou Tentyard Furniture Co.,Ltd. knitted pouf knitted pouf,they come in various sizes. We can als provide stool cover . Qingdao XYD Arts & Crafts Co., Ltd. It ensures that our clients get exactly the product they wanted and in this way begins a long association between them & us. As the company grew, it expanded the portfolio of the products that helped Quality India gain a firm footing in the market. Future Creativity and continuous innovation drives Quality India as we continue to evolve as a leader in the industry. 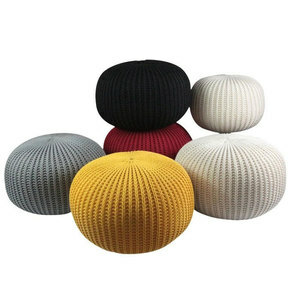 Raymond Ningbo Industrial & Trading Co., Ltd.
Alibaba.com offers 734 knitted pouf products. About 54% of these are stools & ottomans, 10% are living room chairs, and 1% are table cloth. A wide variety of knitted pouf options are available to you, such as fabric, wooden, and synthetic leather. You can also choose from modern, antique. As well as from no, yes. And whether knitted pouf is free samples, or paid samples. 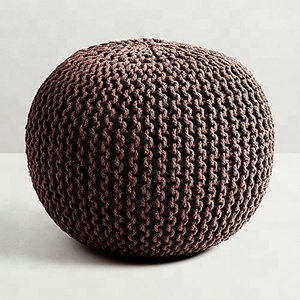 There are 655 knitted pouf suppliers, mainly located in Asia. The top supplying countries are China (Mainland), India, and Morocco, which supply 53%, 42%, and 4% of knitted pouf respectively. 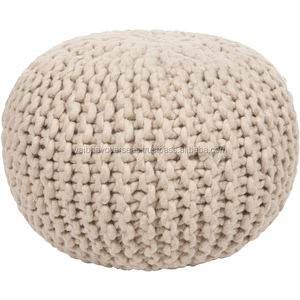 Knitted pouf products are most popular in North America, Western Europe, and Domestic Market. You can ensure product safety by selecting from certified suppliers, including 74 with ISO9001, 41 with Other, and 13 with BSCI certification.